Inspired by a few of my favorite vintage and farmhouse items, these are our first 4 pins Enamel Pins in our Vintage Sewing and Farmhouse collections available for a special price if you purchase them all together. Each pin is made from what is called "hard enamel" which means that it is smooth and the colors are baked in with a metal outline around the outside of each shape. The Retro Scissors and the Mason Jam Jar pins have a silver finish around the outside. The Vintage Sewing Machine and the Tomato Pincushion pins have a gold finish around the outside. All 4 pins are designed using our signature Fig Tree colors with special details and extra touches on each one. Absolutely perfect for any sewer or crafter... or one set for you and another for your bestie! Won't you join us in our enamel pin addiction? 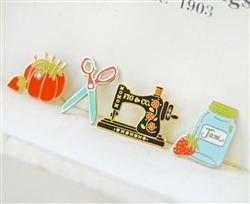 Adorn yourself, your bags, your bulletin boards and a hundred other places with these adorable vintage inspired enamel pins! Pin are app. 1" to 1 ½" wide and come with a butterfly backing, on a cardboard card.